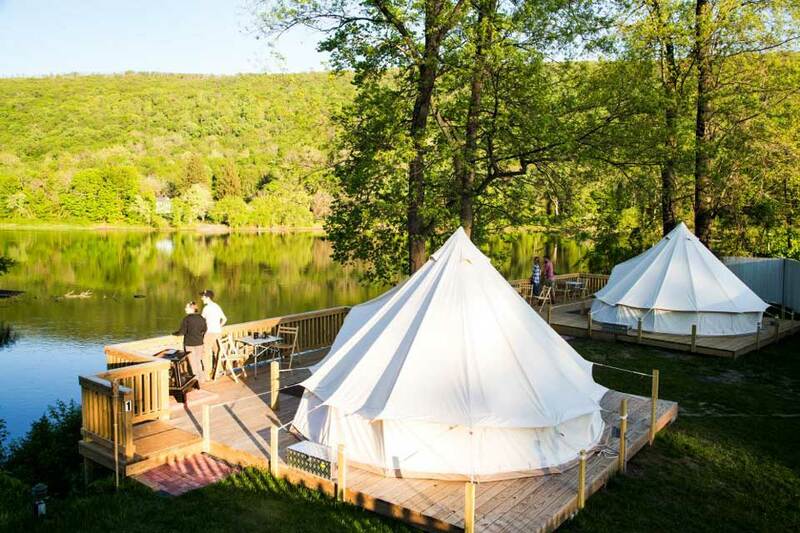 For some, lodging is simply a place to rest weary heads between travel experiences – but many Pennsylvania hotels, lodges, campgrounds, and bed and breakfasts are truly destinations in themselves. So pack your overnight bag and get ready for a special adventure at one of these unique accommodations. Family-friendly amenities at The Hotel Hershey® in Hershey include a complimentary shuttle to Hersheypark®, multi-pool swimming complex, and a kids’ club with activities like ice cream making, arts and crafts, and fun at the Children’s Garden Butterfly House. With kid-pleasing events like July’s Yankee Doodle Days featuring marshmallow wars and late-night bingo, Rose Point Park Cabins & Campground in New Castle is perfect for families. Additional onsite entertainment includes fishing, swimming, hiking, and biking. Spacious wooded sites, cabin rentals, and plenty of onsite fun make it easy for groups with little ones in tow to enjoy Colonial Woods Family Camping Resort in Upper Black Eddy. Hook a big one in the stocked fishing lake, play a round of miniature golf, and partake in a weekend theme parties. Featuring accommodations in 38 refurbished train cabooses, a stay at Red Caboose Motel in Strasburg is truly unforgettable. Railroad-inspired fare and Lancaster County favorites are served at the motel’s eatery, which is housed in an original Pennsylvania Railroad dining car. Experience the artistry of Frank Lloyd Wright at the Duncan House at Polymath Park Resort in Acme, an excellent example of the lauded architect’s Usonian designs (his vision for affordable modular houses). You can rent out the entire 1957 home, which is nestled on Polymath Resort’s 100 wooded acres in the heart of the Laurel Highlands. MacDarvey Castle sits on Winslow Hill in Benezette, the stomping grounds of the largest free-roaming elk herd east of the Mississippi. Complete with chandeliers, a stone dragon, and faux stone foyer, the property’s furnishings are meant to capture the imagination. Access to a private elk-viewing area is also included with your stay. Rent a houseboat from Seven Points Marina in Hesston to experience life on Raystown Lake, an 8,300-acre beauty in Huntingdon County. With bathrooms, air conditioning, basic kitchenware, and grills, the houseboats are fully equipped for summer fun. A winner of the 2016 TripAdvisor Travelers’ Choice Award, the 1891 Mansion District Inn in Smethport boasts three-course gourmet breakfasts, elegant Victorian furnishings, and a prime location in the heart of the Smethport Mansion District. Book the McCandless Executive Suite, which has a private theater room with surround sound. Butler County’s Hotel Saxonburg, established in 1832, pays tribute to its roots by maintaining the property’s original Victorian dÃ©cor in its restaurants and five guestrooms. German-born John A. Roebling – famously known for inventing wire cable and designing suspension bridges – founded Saxonburg the same year the hotel was built. The 1925 Woodside Lodge, situated on the south side of Spring Mountain in Schwenksville, combines old-fashioned hospitality with modern amenities. Have breakfast on the country-style porch, recline next to your in-room fireplace, and take a zipline canopy tour at nearby Spring Mountain Adventures. Tucked on the shores of Crystal Lake, beautiful Fern Hall Inn in Clifford is an Upstate PA gem. Tee off at the nine-hole golf course, slumber in stately guestrooms adorned with 1900s-era furnishings, and savor dishes like Berkshire pork chop with apple-raisin chutney in the dining room. Book a cabin, suite, or lakefront cottage at Lake Erie Resort in Erie to enjoy picture-perfect sunsets over the water. Spend your days relaxing or fishing on the lakeshore – accessible via a convenient staircase from the resort. USA Today and 10best recently named Erie’s Presque Isle State Park. Hand-carved woodwork, ornate plaster ceilings, and intricate stained glass accentuate the romantic ambiance at Reading’s The Inn at Centre Park, built in 1877. Nearby attractions include the Reading Pagoda and Santander Arena and Performing Arts Center. Pocono Palace Resort in East Stroudsburg, one of three adults-only properties in the Cove Haven Entertainment Resort family, offers romantic escapes on private Echo Lake in the heart of the Pocono Mountains. Bonding activities for duos abound, including laser tag, paint ball, roller skating, tennis, fishing, and paddleboating. Set on 112 acres of rolling hills and lush forests, Owens Farm in Sunbury is flanked by the Susquehanna River Valley’s bucolic grandeur. Reserve The Loft, the farm’s guesthouse, and mingle with all of the property’s adorable residents, including hundreds of sheep and dozens of pigs, chickens, turkeys, and horses. 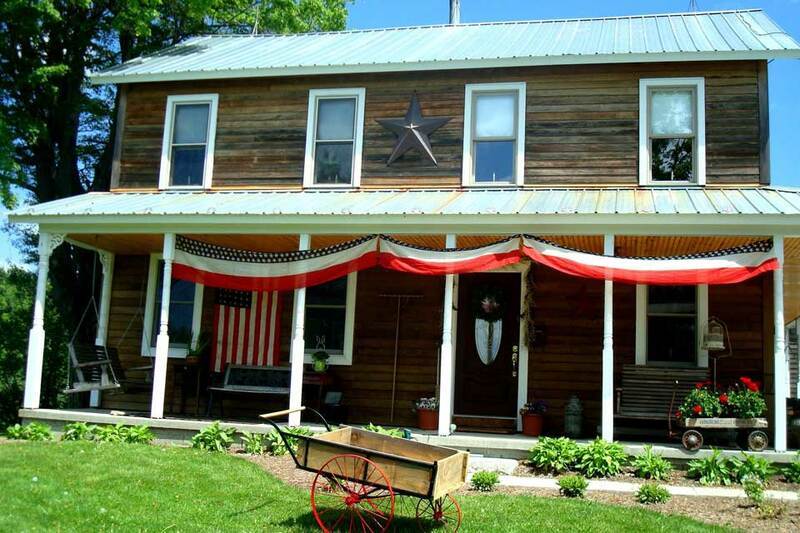 Lovely butterfly gardens and three themed guest rooms housed in a lovingly restored farmhouse make Armstrong County’s Paganelli’s Butterfly House in Sarver a charming weekend retreat. Other perks include a deluxe continental breakfast, a pool, and an adjacent stocked trout stream. ArvgÃ¥rden is a Swedish-style bed and breakfast and farm near Wellsboro that offers more than 100 acres of woodlands and fields to explore. Several miles of walking paths and trails are available, and nearby sights include Pine Creek Gorge (the Grand Canyon of Pennsylvania) and the Pine Creek Rail Trail, popular with hikers and bikers.